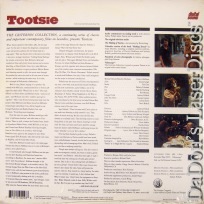 Videodisc Version of the Book "Making Tootsie"
Tootsie 1982 - 116 min. - Color Genre: Comedy Rated PG Country: USA LaserDisc Movie Storyline: When theatrical mastermind Michael Dorsey (Dustin Hoffman) finds himself blacklisted by just about every producer in the acting business, he decides to thwart the entertainment industry by disguising himself as an older woman and auditioning for a daytime soap opera. Dorsey arrives for the audition in a dress and makeup. Calling himself Dorothy Michaels, he/she gives an astonishing screen test and is hired on the spot by the show's executive (Dabney Coleman). Dorsey is an overnight sensation with the show's fans, but as his secret career escalates, his relationship with his girlfriend (Teri Garr) suffers. Soon Dorsey finds a new romantic interest at work with his co-star, Julie. The only problem is, Julie thinks Dorsey is a woman and it's not long before she's trying to fix up Dorothy with her single father. In the tradition of Mel Brooks's THE PRODUCERS, Sydney Pollack's TOOTSIE is a rich, funny, complex film. In featuring Hoffman as the smock-wearing protagonist, its boldness exposes movie-goers to the hilarious challenges faced by a modern cross-dresser. At the same time, the film promoted tolerance for transgendered people. Hoffman is unforgettable as the actor so desperate for work that he'll dress as a woman to get it, and supporting players Geena Davis and Bill Murray create plenty of comedy relief to help the plot along. LaserDisc Movie Review: Michael Dorsey (Dustin Hoffman), a brilliant but troublesome New York actor, has managed to alienate every producer on both coasts. Michael's agent George Fields (Sydney Pollack) can't even get his client a commercial since Michael complained that the tomato he was playing wasn't properly motivated. "You were a tomato!" screams George in desperation, adding that Michael is so obnoxious that he will probably never work again. Dorsey thinks otherwise; when he hears of an opening on a popular soap opera, he applies for the job even though the job is for a woman. Posing as "Miss Dorothy Michaels," Michael wins the part and becomes a widely-known actress. Yet complications ensue when Michael falls for his co-star Julie (Jessica Lange, in an Oscar-winning performance) but, as Dorothy, is courted by Julie's widowed father (Charles Durning). Michael ultimately finds that his disguise as a woman has made him a better man. 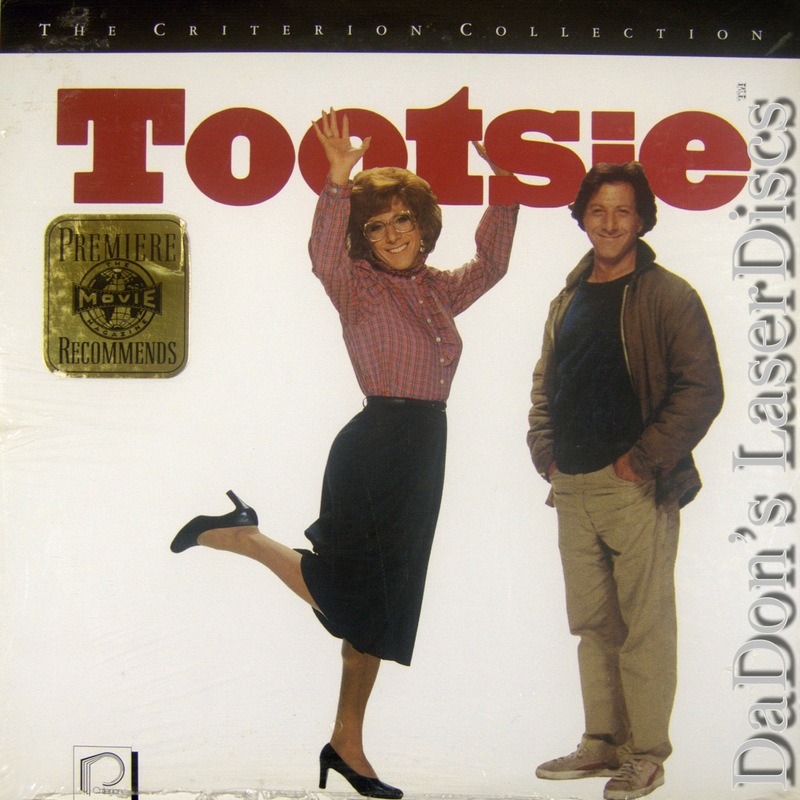 One of the classic comedies of the 1980s, Tootsie's gender-bending premise boasts a screenplay by Larry Gelbart and Murray Schisgal, and by a host of memorable supporting comic performances from Dabney Coleman, Teri Garr, George Gaynes, and Bill Murray. Future Oscar-winner Geena Davis makes her screen debut as a daytime drama queen, which indeed she had been before Tootsie came along. --- Hal Erickson Situated somewhere between Some Like It Hot and The Adventures of Priscilla, Queen of the Desert, Tootsie provided one of the most salient commentaries on gender roles in American society, long before RuPaul sashayed across the popular consciousness. 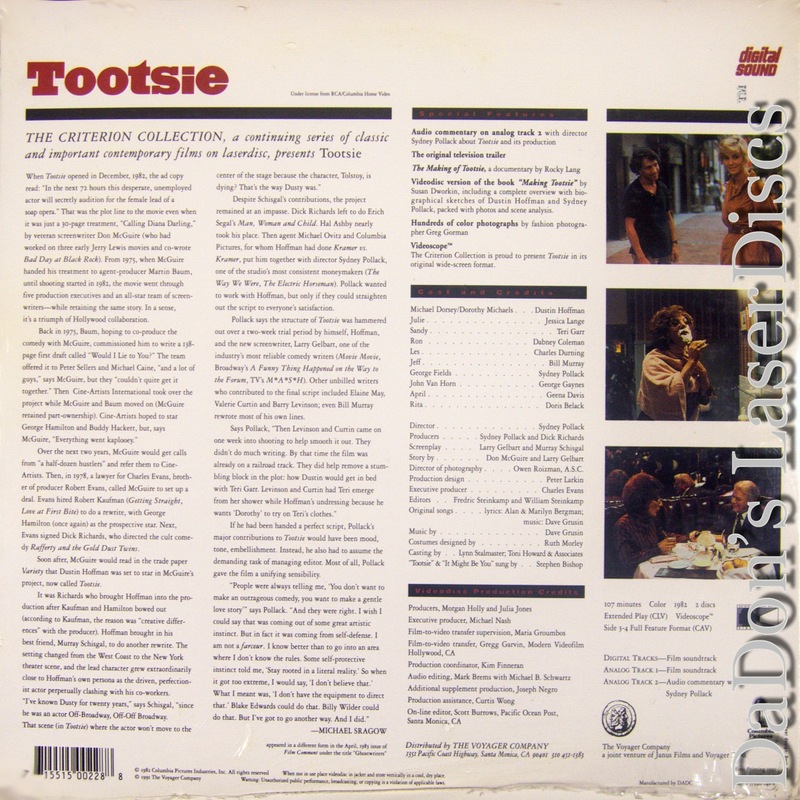 A film about a man who discovers that being a woman makes him a better man, Tootsie explored areas hitherto avoided by most filmmakers, and it became one of the few genuinely hilarious American comedies of the 1980s in the process. The film was remarkable for the quality of its lead performances: Dustin Hoffman, as the title character, expertly blended withering cynicism and comic sensibility, while Jessica Lange (who won an Oscar for her performance), Bill Murray, and Charles Durning did some of the best work of their careers. Even Geena Davis, who made her debut as a barely clothed soap opera ingenue, was memorable in her small role. In all, Tootsie accomplished what few films do, forcing audiences to question their own attitudes while giving them a highly intelligent laugh. --- Rebecca Flint Thanks for Visiting DaDon's Rare LaserDiscs ! Reviews, Articles, Newsletter and Information for Movies on LaserDisc LD Laser Disc, LazerDisc.